There are several different ways to render Inventory Items. The parts of the code that do this are summarised in the diagram below. If you aren't really interested in the details, you may as well jump straight to the sample code. RenderItem.renderItemAndEffectIntoGUI(). This renders the item itself, and is followed by a call to renderItemOverlayIntoGUI, which adds the item count for multiple items (eg stack of 64 dirt) and the damage bar for damaged items (.isItemDamaged() and .getItemDamageForDisplay()). For non-block items (eg pickaxe), RenderBlocks.renderItemIntoGUI just draws the Item's getIcon() directly onto the screen. If your item is a custom block, you will probably have given it a special Block renderType to render it correctly. In this case, you can add code to your custom Renderer which implements ISimpleBlockRenderingHandler.renderInventoryBlock(). See .renderBlockAsItem for plenty of vanilla code showing how to render them. Use [0,0,0] to [1,1,1] as the extent of the block, it has already been scaled, rotated, and translated appropriately. If you tessellate directly, do not forget to .setNormal() to match each face otherwise the lighting will look strange. (See .renderBlockAsItem). 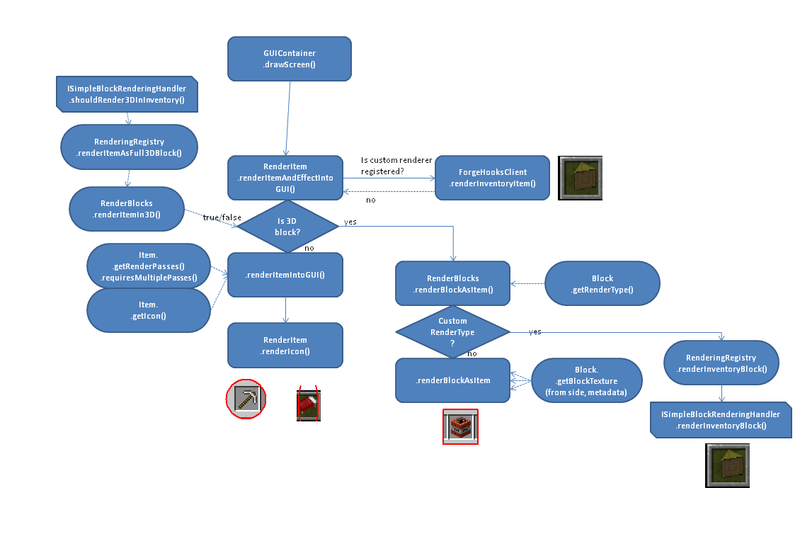 Code tree showing the various places that different types of item renders are performed for Inventory items.